It’s been over a decade since the Twilight Saga captured the attention of the world. From novels to movies, and makeup to jewelry, the Saga took the world by storm. People became obsessed with a small town in Washington with enough fog to cover the appearance of a family of vampires. They also wanted nothing more than to find a place in the Cullen coven themselves. Taking a look back at the phenomenon, we’ve started looking at the tie-in products, the fan creations, and the behind the scenes memorabilia that every Twihard would be lucky to own. Whether you want to look like a vampire, smell like a vampire, or just own a little piece of the franchise history, there’s definitely something out there for you. Some companies have worked hard to recreate the magic of the movies with replicas of the jewelry worn by characters. Others reward fan knowledge with games and books. Even if you’re a fanpire, there are even plenty of pieces of wolf memorabilia out there for you too. We’ve rounded up some of the most interesting items on the internet - some of which will even allow you to taste the Twilight Saga. Take a look through 20 Twilight Things Every Fanpire Needs to find the perfect piece of the franchise for you. When the first of Stephenie Meyer’s Twilight novels made the jump to the big screen, the team behind the film took an extra step to unite the Cullen vampires as a family. They created a family crest for them. It appears throughout the movies - most often on pieces of jewelry. If you want to feel like a part of the family, owning a piece of replica jewelry is the way to go. It’s a simple way to dress up your own wardrobe, but cosplayers could also find enough detail to use it as part of their ensemble. As a fan favorite, Rosalie Hale had one of the standout pieces of jewelry. This particular replica of her necklace isn’t pure silver, allowing for a less expensive price. It’s made, however, from a heavy metal, so there’s plenty of weight to it. There are a lot of fans who gained their introduction to the Twilight Saga through the movies rather than the books. For those who prefer more visual methods of storytelling, the graphic novels are a great find. The graphic novels don’t adapt the movies, but instead, adapt the original novels into comic book panels. That means movie lovers get a bit more detail from the books and book lovers get a new take on the story they already love. The artwork is also very similar to Stephenie Meyer’s Illustrated Guide, keeping her vision of the characters consistent, thanks to writer and artist Young Kim. The Collector’s Edition combines Twilight and New Moon into one volume, making it a bargain for collectors. If Barbies aren’t your thing, we’ve got another option for you. Funko’s POP figures have become more and more popular as they release figures for new and old pop culture franchises. From the Golden Girls to the X-Men, Funko has just about any POP figure you could want. They also have Twilight figures. If you didn’t want your Bella Barbie to be lonely, this one might be a better option for you as well. Bella isn’t on her own. Instead, the set includes Bella and Edward. It also includes the vampire version of Bella instead of the human from the early days of the saga. Keep them in the boxes to keep them safe, or display them as part of a larger collection. Either way, these Funko figures are sure to be POP-ular. Not only is there enough memorabilia out there to make you feel like you’re a member of the Cullen family, you can also make your home or office smell like the most memorable Cullen of all. Light up a Team Edward candle and you can create an atmosphere that smells as heroic as him. According to Define Design 11, the candle smells like, “diamonds in the sun, flawless beauty, and immortality.” That sounds like a scent we can get behind. Of course, Edward vs Jacob might be one of the most hotly debated topics in the Twilight Saga. If you thought Bella should have wound up with Jacob instead, there’s a candle for him too. Most people are familiar with Hallmark for manufacturing greeting cards and running romantic movies during the holiday season on their TV network. The company also creates keepsake ornaments to hang on Christmas trees. These ornaments are typically created in limited quantities with new pop culture ones released every year. Some people like to collect them, storing them for most of the year until bringing them out to share with friends and family during the holidays. Most recently, their superhero ornaments have become pretty popular, but they’ve also got some Twilight keepsakes. This one, in particular, features Bella and Edward, the central love story of the Twilight Saga. It seems appropriate for the biggest fans to share their holiday with the duo, even if it’s just by giving them a prime spot on a branch on their Christmas tree. One of the traits of the vampires in the Twilight Saga is that they can’t hide who they are when the sun is out. They don’t turn to dust in the sun’s rays. Instead, their skin glitters like diamonds. If you want to look the part of a vampire, all you need for a little sparkle is some body glitter. There’s a wide variety of glitters on the market, but Paul Ruth Skin’s body glitter beats them all. For one thing, you can use a little amount for a subtle shine if you don’t want to go full vampire. For another, their body glitter is also an eco friendly moisturizer. Their formula includes essential oils and aloe vera to make sure it’s not drying out your skin. The glitter itself isn’t harmful to animals, children, or the environment. Everybody wins. For those who have watched the first Twilight movie a dozen times and those who have dialogue memorized, Scene It is the game for you. Variations of Scene It exists for the Harry Potter franchise, the Marvel Cinematic Universe, and Disney animated movies, amongst others. It’s similar to Trivial Pursuit in that players work their way around a gameboard by answering questions. Unlike the original Trivial Pursuit, Scene It doesn’t solely rely on question and answer cards. With the added element of DVD gameplay, fans of Twilight answer questions about scenes they view and play additional puzzle games. Just be a good sport and don’t force friends and family who aren’t familiar with the franchise to play with you. A lot of journalers have made the technological leap to blogging or vlogging these days. If you still like the old fashioned pen and paper, and you’re a Twilight fan, there’s a whole set of journals for you. They’re perfect for looking out the window, dreaming of a foggy small town, and writing your own life story (or grocery lists, goals, letters to your future self, etc.). Not only are they designed based on the appearance of the four part series of novels, they also come with a keepsake tin for storage. The pages aren’t just blank either. You’ll find writing inspiration from images and quotes throughout the pages. Some of the quotes come from Twilight; others come from classic works that helped inspire the vampire story. Barbie dolls aren’t just for kids anymore. Like many toys manufactured in limited quantities, the Barbie brand is something a lot of collectors like to monitor. If you’re a Twilight fan, there are quite a few Barbies released as a tie-in to the movies. Part of the Pink Label Barbie line, Bella was created for the first Twilight movie. She’s poseable and comes with a Twilight labeled stand if collectors want to take her out of the box. Of course, if you’re someone who wants the doll to see a little love and doesn’t mind when the kids play with it, the fact that she has bendable knees is good for that as well. For the Twilight fans who want more backstory on characters other than Bella and Edward, this book is a must. It is not, however, the illustrated guide to the movies, but instead to the series of novels. Writers frequently have to trim their stories down for their editors, or think of history for characters that never naturally flow into their plot. That means all of the details Stephenie Meyer didn’t have the space (or time) to include in her saga makes it into this book instead. Fans will find details about character backstory, locations, and familial connections. They’re also treated to a glimpse inside of the mind of Meyer herself. That’s because the character illustrations in the book are how she originally envisioned the characters. If part of the draw of Twilight for you is the atmosphere of the Pacific Northwest, but you live somewhere with a completely different look and climate, there’s still a way to immerse yourself in Forks. Instead of lowering your thermostat or creating your own fog, think about decorating for the atmosphere you want. 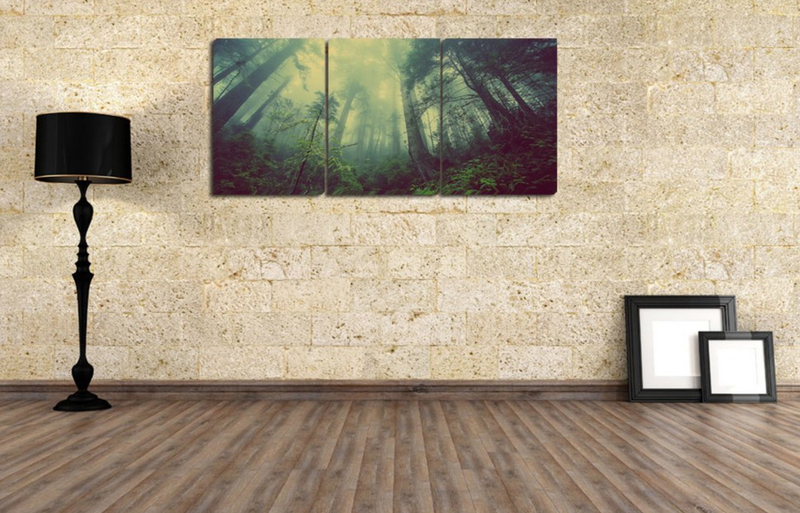 A three piece set of wall art is a great way to change the look of a room. It takes up a large portion of a wall, so it becomes a focal point of your decorating. Perfect for those who wish there were in Forks is the forest landscape with just a hint of fog. It’s like you’re standing in the middle of the woods with Edward and Bella. Have you always wanted to take a bite out of Twilight? Do you like to bake, but some cake art is beyond your talents? Edible cake art featuring the Twilight characters is definitely the way to go. Cake art can be tricky. These days, dotting a few flowers on a cake doesn’t always have the presentation you want. If you’re a big Twilight fan, or you know another one, edible glitter or the faces of the characters is going to make a larger impact than roses or a written quote in icing. Featuring Edward, Bella, and Jacob, this piece of art is a thin sheet with an edible picture. You simply peel the storage paper off of it and stick it on the top of the cake! It sounds easy, but cake art is incredibly fragile, so work carefully. Plenty of bibliophiles have a love for built in library shelving, or that one book that leads to a secret passage in the wall. While this list doesn’t include those, it does have another great thing for book enthusiasts: a Twilight themed book safe. The safe is the same size and shape as a regular book with plastic “pages” that look like the real thing. Once you open the cover though, you’ll find a lock you need a key for. It’s the perfect way to hide a few of your prized possessions in plain sight. Best of all? The book cover is customizable. Even if you want it Twilight themed, you can put your own spin on the text printed there, making it an even more unique piece of memorabilia. Forks became a pretty famous small town thanks to inspiring Stephenie Meyer’s work. The town provided the fictional setting for the events of the Twilight novels, though the movies weren’t able to be filmed in the real location. Despite that, the residents of Forks embraced the franchise wholeheartedly. This documentary runs just under 90 minutes and it gives fans an idea of what the real town is like, and just how Twilight effected it. You can get a brief rundown of the history of the town, their Twilight tours, and information about the Quileute legends that inspired Jacob Black’s family. Maybe the documentary will even inspire you to book a trip to visit the real thing. Maybe you don’t just want to wear the Cullen family crest, sparkle like a vampire, and get the inside scoop on Forks. Maybe you really want to look like Edward Cullen. If that’s the case, Celebrity Cutouts has you covered. The company specializes in creating face masks of famous people. They carefully select photographs of celebrities to use, and then, they turn them into masks for all your masquerade needs. Maybe you’re heading to a Twilight themed party and want a talking point, or a great addition to a photo booth. You might want to make your Edward Cullen cosplay a little more authentic. Whatever the reason, we don’t judge. The Robert Pattinson mask will complete your look. We’ve focused a lot on the vampires at the center of the Twilight Saga, but there is another group of supernatural beings who deserve some focus as well. The wolves are a large part of the saga. In addition to Bella’s friendship with Jacob, his friends also help protect her and the Cullens, and Jacob eventually imprints on Renesmee, Bella and Edward’s daughter. Plenty of readers associated the idea of imprinting with a fairytale-esque destiny. Jacob and Renesmee belong together in some way - whether it’s as friends, family, or eventual romantic partners. If you’re one of those fans, this piece of jewelry is a way to honor that belief in destiny. The sleek silver band contains the words “I’ve Been Imprinted” on the outside. We’ve already given you advice for sparkling like a vampire; why not smell immortal too? Immortal is the official fragrance of the Twilight movie franchise. It was created as a tie-in product along with different kinds of makeup. While the makeup is long gone from stores, you can still find the fragrance online. Immortal is definitely a more feminine scent, created with Bella Swan in mind. The fragrance contains notes of citrus, chamomile, white freesia, peony, patchouli, amber, and musk. It combines the floral scents of younger perfumes with the more classic notes of amber and musk, making it a good buy for all ages. The perfume also comes in a pretty purple bottle with the “immortal” script and an etched feather, making it great to display once you’ve used the scent. If you’re looking for something a little special when it comes to Twilight replicas, this piece of jewelry is about as special as you can get. Meant to resemble Bella’s engagement ring, this ring has plenty of sparkle and shine without looking gaudy. Since it’s made with cubic zirconia instead of diamonds (100 pieces, to be exact) the price won’t be as outrageous as a diamond engagement ring. If you’re reading this, and you aren’t the Twilight fan, it makes a great gift for a special occasion for the Twihard in your life. This ring is great for everyday wear or cosplay, so if you’re a fan who likes to get good use out of your fandom finds, this one will be right up your alley. If Rosalie’s necklace wasn’t enough of a taste of the Cullen family for you, you can always splurge and get the complete set of the Cullen family’s jewelry. In addition to Rosalie’s necklace, the set includes Alice’s choker, Esme’s bracelet, Carlisle’s ring, and Edward’s wrist cuffs. You can always pick your favorite to wear and display the rest since the jewelry comes in a display case as well. Since it’s made by NECA, the company that made several official prop replicas, it’s also got an autographed postcard from Carlisle himself - Peter Facinelli. Just be sure to search your case for it as it’s usually tucked away to prevent damage. With a run of only 3,000, this set is one fans will be scouring auction sites for once vendors run out.